Costa's Hummingbird - Desert Lovin' Hummer! The Costa's Hummingbird, also known as Calypte Costal, was named for Louis Marie Pantaleon Costa, the Marquis de Beauregard who lived from 1806 to 1864. This hummer has a metallic shriek call when trying to attract a mate. He also produces a chattering sound of “tik tik” or “tchik” produced by vibrating tail feathers. When the male is trying to impress the female, he dives and swoops from high in the air, while always using the angle of the sun for preening and showing off his glistening purple throat. He is superb at acrobatic maneuvers and sometimes even flies zigzag patterns low to the ground. MALE COLORING: The male has a violet purple gorget, crown and throat with long extensions on the corners. Outer feathers are usually greyish green or metallic green and juvenile Costa's can usually be identified with a “five o'clock shadow” on their chins and throat. FEMALE COLORING: The female is a pale grey underneath with a greenish color on top and one might see black or purple spots on the throat. SIZE: The Costa's is a medium 3 to 3 ½ inch size. BILL: This bird has a short, thin bill. TAIL: The tail is short and notched and barely longer than the wings. MIGRATION: You will find Costa's in southern California, southeast Arizona and western Mexico. They love the Sonoran desert area and winter on the Pacific slopes of Mexico. MATING/NESTING: They nest from late winter to spring in small cups of plant materials coated with lichen on tree limbs or yucca stalks. It will take the 2 eggs 15 to 18 days to hatch and another 20 to 23 days for the young to leave the nest. This desert loving hummingbird is prevalent in California and Arizona in spring, but can be found in many southern states as well as a few in the northwest section. Cross breeding and hybridizing with other similar hummers like the Black-chinned, Broad-tailed, Anna's and Calliope have made identification and studies difficult. The hybrids are also reducing the gene pool of each of the different species. Dangers lie in the desert habitats of the Costa's from intensive cattle grazing and clearing of desert scrub areas for agricultural purposes and flood control. South African bufflegrass is being replanted for cattle, but is a plant that fuels fire easily which wipes out the native flowers that the Costa's love and need. 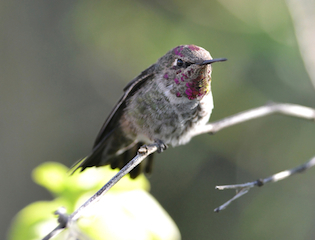 Costa's Hummingbirds don't travel great distances and are usually among the first visitors to arrive in spring.